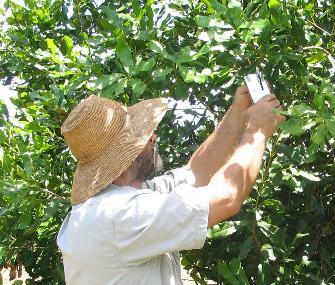 Crops with typically moderate to high levels of MNB (which are sprayed once or more each season) will benefit the most from releases of Trichogramma (compared to crops where MNB only occasionally require spraying in a typical season). MacTrix lay their eggs into the the egg of nutborer. 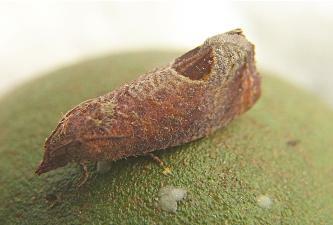 They develop into fully formed wasps inside the moth egg. The wasps emerge from the black eggs about 10 days later - 2 or 3 wasps from each egg. The wasps mate and the females go in search of MNB eggs to lay their own eggs into. 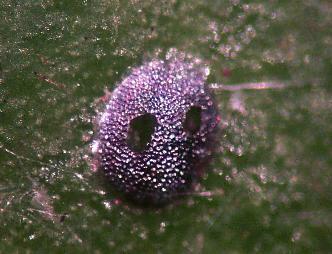 They are a very effective parasitioid able to hunt through dense foliage and into the tops of trees. Parasitism rates are often high with spraying significantly reduced. There are also indications that good Trichogramma activity reduces the pressure in the following season. 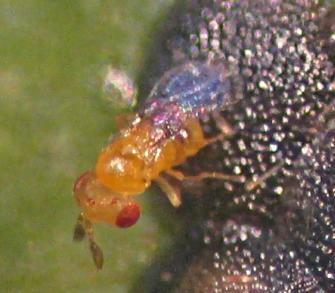 T. cryptophlebiae is a very effective parasitoid able to find MNB eggs in dense high trees and commonly achieving very high levels of parasitism. Maxtrix wasps are only half a millimetre long. The Trichogramma are dispatched as parasitised nutborer eggs on sheets of finely corrugated cardboard 180 mm x 370 mm. The sheets are perforated to enable them to be gently broken up into 24 individual cards each about 30 mm x 90 mm. Before despatch the sheets are sorted into different egg densities so that parasitised eggs per sheet range from 500 to over 2,000. They are sold by the thousand parasitised eggs for $25 to $30 depending on quantity. Trichogrammatoidea cryptophlebiae are used inoculatively, that is, relatively small numbers of wasps are released per hectare per release - their numbers increasing within the crop as the moth egg pressure increases. Releases of 1,000 wasps per hectare are made for 6 to 10 consecutive weeks starting from early November to late December depending on the location. The aim of this strategy is to parasitise some of the early laid eggs which may be below the level picked up in a standard monitoring check. One egg in 500 nuts is enough for Trichogramma to get started. When eggs start showing up in monitoring checks some of these are likely to be parasitised and are able to increase very quickly when the egg pressure rises. In this way sprays are likely to be saved. If you wait until moth eggs are showing up in numbers before starting releases then it may be several weeks before parasitism rates are high enough to consider not spraying.